Bahco has manufactured saws for more than 130 years in the world's largest handsaw factory in Sweden. Continuous development work, in close co-operation with professional experts, is a vital ingredient in the quest for developing new and better saws and Bahco is a world leader in the manufacture and supply of premium bowsaw blades. Bahco ERGO bowsaws are made from high quality steel and protected by a coating of high-impact enamel paint. 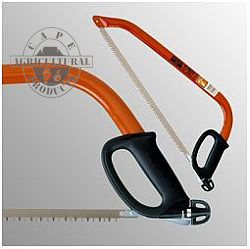 The Ergonomic, integrated handle makes sawing effortless and comfortable at the same time. 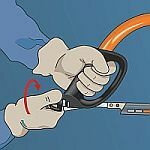 The innovative, easy-to-use tension mechanism allows for maximum tension and safe handling. This high blade tension, up to 120kp, is critical for best performance and straight cutting. 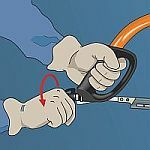 The virtually unbreakable hand guard makes knuckle and hand injuries a thing of the past. # 3. 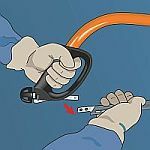 - When the new blade is in place, tighten the mechanism to the maximum tension and you are ready to go. * This tension mechanism is only available on the ERGO Force bowsaws, which are available in 530mm, 600mm and 750mm lengths. Bahco bowsaws are also available in an economy range. These bowsaws are manufactured from lighter metal tube than the FORCE range but still have the same high quality blade that Bahco is famous for. The best quality blade is essential for successful cutting. and are fitted with "type 51" blades which are used for effortless cutting of both dry and green wood. A plastic knuckle protector is also supplied. Peg toothing, which is the most commonly used tooth variation used on bowsaw blades in South Africa, has triangular teeth with the tips pointing downwards. The teeth have sharp edges on both sides and are set. The blades cut on both the push and pull stroke. Peg toothing has every gullet extended for high chip transportation out of the cut. 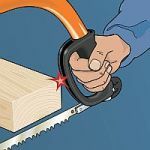 Peg toothing is designed specifically for fast and effective cutting of dry, hard wood, as well as for cross cutting fresh, green wood. Raker toothing also has triangular teeth with the tips pointing downwards. The teeth have sharp edges on both sides and are set. Every fifth tooth is a raker tooth which functions like a chisel and every third gullet is extended for high chip transportation. 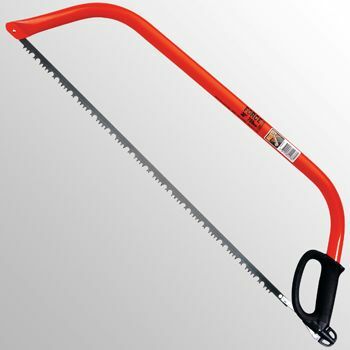 Raker toothing is designed specifically for fast and effective cutting of green and damp wood. Spare blades available in 530, 600, 750 and 900mm lengths.